The terminal is also called Gangnam Express Bus Terminal. It is Seoul’s main bus terminal, along with the Subway Line 3 Express Bus Terminal. It has an underground shopping mall that sell clothing at reasonable prices, so many people visit the mall. This terminal is operating Honam Line after being moved from Seoul Express Bus Terminal. The Central City Terminal has department stores, theaters, synthesized terminals, and hotels within the building. It is located next to the Seoul Express Bus Terminal, and is connected to the Express Bus Terminal Station of Subway Line 3. It is like a complex leisure town where visitors can enjoy shopping and watching movies at the department stores and theaters that are located within the terminal. This terminal was constructed to operate the intercity bus lines that used to be operated by the Seoul Express Bus Terminal. It is located at the Nambu Terminal Station of Subway Line 3. It operates lines going to the metropolitan area, Chungcheong-do, Jeolla-do, and Gyeongsang-do areas. The Gangwondo Line, which goes to Jumunjin, was opened here on May 27, 2013. It is located near the Seoul Arts Center and the International Electronics Shopping Mall, so visitors can enjoy both shopping and entertainment. This terminal is located in Seoul Gwangjin-gu. It provides transportation convenience to residents in the eastern and northern areas of Seoul, and has helped to revitalize the Jungbu Expressway. It is equipped with 15 express bus lines (Daegu, Daejeon, Masan, Busan, Jinju, Changwon, Cheongju, Gangneung, Gwangyang, Sokcho, Donghae, Samcheok, Yangyang, Jeonju, and Jeongeup), as well as with 110 intercity bus lines. A total of 35 bus companies are in business here. 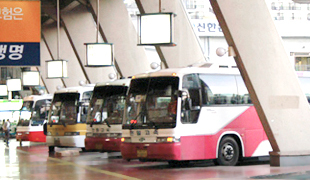 It has major intercity bus lines that go to Gyeonggi-do and Gangwon-do. 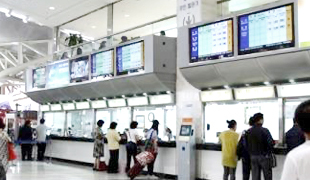 The terminal also operates lines that go across the nation such as Gyeongsang-do, Jeolla-do, and Chungcheong-do. It operates 1,200 buses daily, and can transport a daily average of 30,000 passengers. Its maximum daily transport capacity is 70,000 passengers. This terminal was opened on Sep. 2, 1985. It operates intercity buses that go to Gaegun, Gwangtan, Gyomun-ri, Guri, Guksu-ri, Daesin, Sinwon-ri, the Asia Center for Theological Studies and Mission, Yangpyeong, Yeoju, Yongdu,Yongmun, and Cheonseo-ri in the metropolitan area; as well as going to Gangneung, Naksan, Danwol, Dunnae, Munmak, Mulchi, Bokjigol, Saemal,Sokcho, Sinnam, Yangdeokwon,Yangyang, Osaek,Wonju, Wontong, Yuhyeon, Inje, Jangsudae, Jangpyeong, Jinbu, Pungsuwon, Hangyeryeong, Hongcheon, Hoenggye, and Hoengseong in the Gangwondo area.